Enforcement authorities in the US and Asia reportedly are investigating financial institutions for potentially corrupt employment and business relationships with family members of government officials. The investigations underscore policy links between anti-corruption and anti-money laundering regimes where dealings with Politically Exposed Persons (PEPs) are involved. 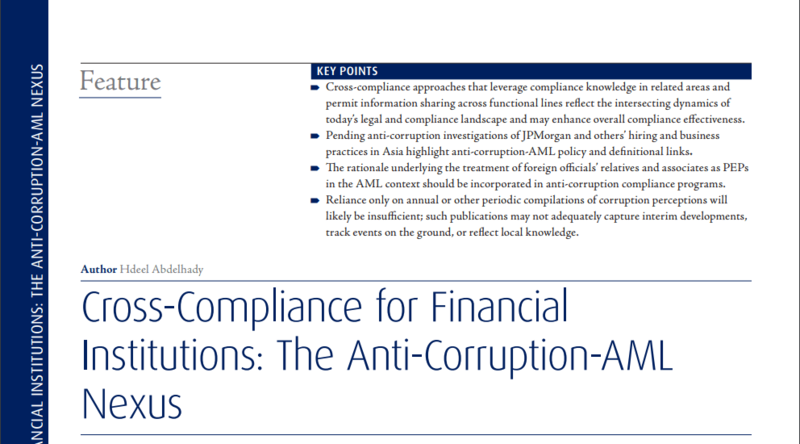 This article, published by Hdeel Abdelhady in Butterworths Journal of Banking and Financial Law, briefly discusses the pending investigations and the anti-corruption-AML policy nexus, and suggests, with respect to PEPs and more generally, that financial institutions facilitate fluidity in their compliance programs to allow for the sharing of information and adaptation of compliance protocols across (sometimes impermeable) internal functional and disciplinary lines. MassPoint PLLC is a boutique law and strategy firm that works with diverse clients to meet legal, strategy, and risk management needs in a globalized, complex world.